When you can’t compete, confuse. That seems to be the tactic used by some of our competitors at times. The latest myth is that our solar pool heating panels have big tube openings, and therefore the flow rate is imbalanced across the panels. Of course, they leave out the science behind their claims, but why rely on facts?! The full flow tubes of the iSwim panel is actually a good thing. A solar pool heating system is essentially a heat exchanger manifold system with hundreds of small riser tubes going between headers. Water from your pool enters the lower header, then travels up the tubes into the upper header before it is returned to the pool, warmer than before. In a perfect world, the flow rate in each small tube would be the same, with each tube working at its maximum potential to heat your pool water. Our competitors who do not use over-molded headers would like to use their small holes where the tubes meet the headers to their advantage… and that’s where the myth begins. 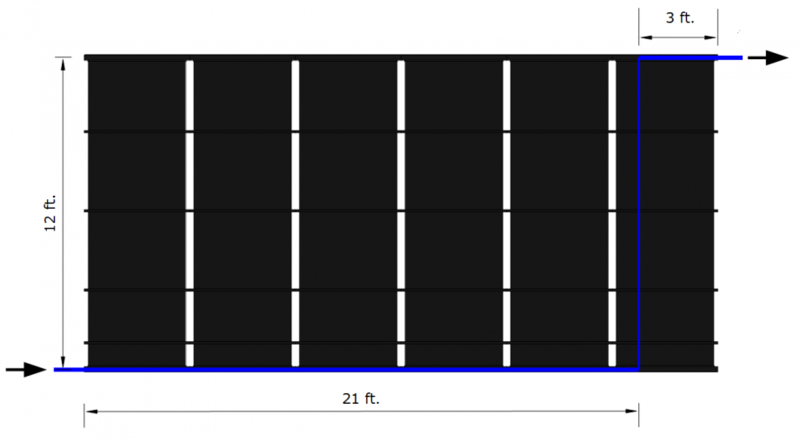 In this case, water flows 24 feet in the panel headers and 12 feet in each tube. No mater which tube we consider, the water travels the same distance in all pipe sizes. At first glance, it looks like it does not matter which tube the water flows through. Since it is the exact same distance, the pressure drop and flow rate would appear to be the same. That’s not exactly the case. In reality, the physics behind fluid behavior in a manifold is far more complicated. 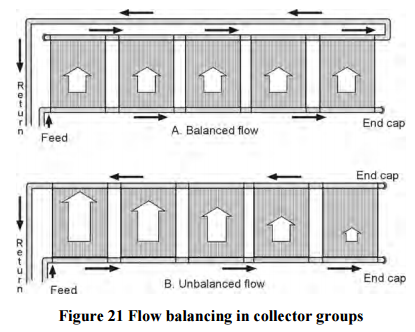 If you really want to dig into this, I recommend the paper Flow Distribution in Parallel Connected Manifolds for Evacuated Tube Solar Collectors by R.C. McPhedron, D.J.M Mackey, D.R. McKenzie, and R.E. Collins of the School of Physics, University of Sydney, N.S.W., 2006. Recommendation: Brew a large pot of coffee and brush up on your calculus first. If you don’t understand the Darcy–Weisbach equation, which describes divided flow in fluid dynamics, you’re just going to have to trust me on this one! By using an opposite end (reverse) return design, the flow rate differences between individual tubes are far smaller. All local dealers install this way with one exception. At the recommended system flow rate, differences in individual tube flow will have no significant effect on panel efficiency and performance. The magnitude of the difference in flow among individual tubes is a function of the ratio of the header pressure drop to the individual tube pressure drop (in layman’s terms, all else being equal, a big header and small tube is better when it comes to balancing). From the Florida Solar Energy Center (FSEC) Solar Pool Heating manual (FSEC-IN-24, 2006). This shows balanced flow for an opposite end return solar pool heater. You might notice that “ratio” is bold, underlined, and italicized above. This is absolutely critical to understand. Our competitors get this half right by stating their smaller tube openings are better. While our individual tubes are larger and are designed to have a low resistance (pressure drop), our headers are a full 2″ inside diameter with a drastically lower pressure drop than our competitors’. 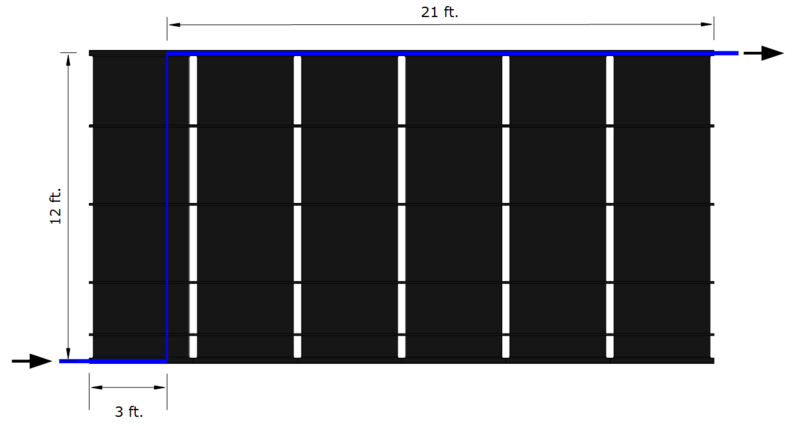 Using a larger header increases the ratio of the header to the individual tubes. While our competitors may have smaller tube openings, they also use just 1-1/2″ headers (one claims to use 2″ headers, but they are actually smaller at the ends). To put the header plumbing size difference into perspective, a typical 8 panel system operating at 40 gallons per minute has three times as much pressure drop in 1-1/2″ pipe than in 2″ pipe (and headers). That means our competitor has to increase the restriction in their individual tubes by a factor of three to get the same uniformity across the panels. Wait a minute — restriction? That sounds bad, right? Absolutely. While flow balance across the system is important, total system flow rate is truly critical to overall system performance. Any heat exchanger benefits from higher flow rate. Higher flow rates reduce performance effects of any imbalance that may exist. Adding restriction to the system does at least one of two things — it reduces overall panel performance and/or increases energy use. That is a simple fact. If you have a single speed pump you will have less flow and lower performance with smaller holes and higher restriction. If you have a variable speed pump you will need a higher speed and more energy to get the same flow rate with any of our competitors’ panels. The truth is, regardless of what solar panel system you select, as long as it uses an opposite end return, the flow rate differences from tube to tube will have virtually no effect on performance. That’s why manufacturers publish recommended flow rates. At the recommended flow rate, any change in flow will have only a minute effect on performance, and small differences in tube flow are inconsequential. What is far more important is how much restriction the overall system adds to your pool plumbing, which does have an effect on performance and/or energy use. Using 1-1/2″ plumbing and headers and having smaller holes for individual tubes reduces flow significantly. Our 2 inch plumbing, valves, and headers provides optimum flow while easily achieving the necessary balance across the entire panel array. To be completely fair, we once bought into the flow imbalance myth, but good science and a great product in the iSwim panel taught us that this myth is debunked. Theoretical, mathematical, and anecdotal evidence have proven that low resistance to flow is the only way to go for superior performance and energy savings, and a properly sized, designed, and plumbed iSwim Solar Pool Heating system will have no problems with flow imbalance. I always thought that is was necessary to use wider plumbing that runs along both sides. I had no idea this has no effect on flow. Very informative post. I am still learning about solar power in general but I find it all very fascinating! Good call on debunking the myth! Well, before seeing the images, I would have been confused, but you easily cleared it up for me. Thank you for that! Very informative yet complicated post. But it does put all those myths to rest. Sad that you would have to explain this just because competitors are spreading false info about it. Great article!